Now that there is reasonable doubt, owing to now-public health problems, that Hillary Clinton will (politically) survive to the election, it's fair to wonder if the previously-unknown Tim Kaine will replace her on the ticket. So... who is this would-be successor to Barack Obama on the American throne? Apollonian: Pallas sextile Mercury. Pallas ruler Venus square the Nodes. Dionysian: Pallas conjunct South Node and opposite Jupiter and ruled by Venus which is quincunx Pluto and square Jupiter. Dionysos wins this one handily. On "The Axis of Good and Evil" this puts Kaine between the "Statist" and "Criminal" quadrants, leaning to the "Criminal". Capitalist: Venus square the Nodes. Collectivist: Venus square Neptune and South Node in Second House (more obvious in other house systems). Mixed signature here, leaning Leftward economically. Perhaps even a lot -- hard to tell with the Nodes. Normally these mixed culture signatures lean to the "liberal" side. 1. Pallas conjunct South Node and opposite Jupiter and ruled by Venus which is quincunx Pluto and square Jupiter. 2. 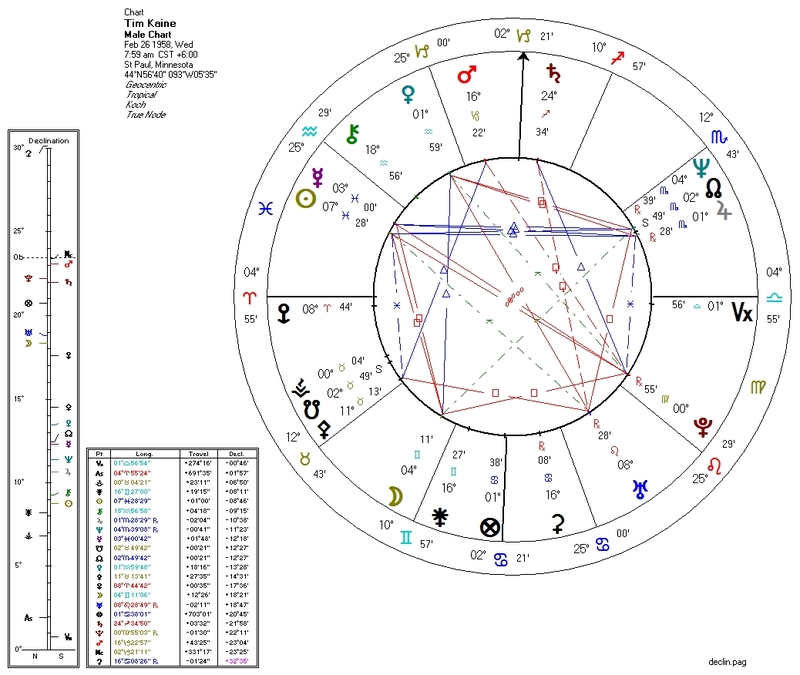 Venus square Neptune and South Node in Second House. This is not a surprise, being that Hillary would have had to approve him. It also explains his (probable) Marxist roots. I am not Donald Trump's biggest fan, but the alternatives don't look very good. A Trump presidency is looking more tolerable by the day.